NEW BOOK! 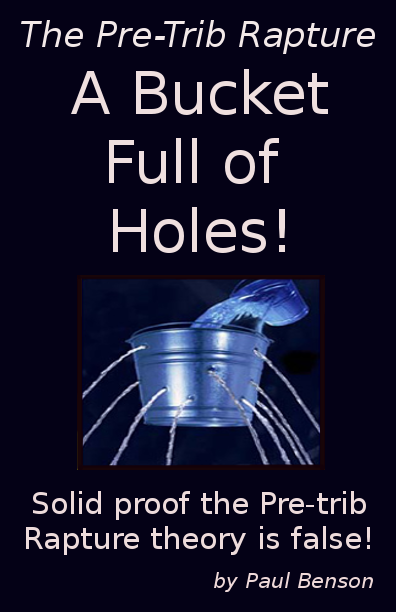 The Pre-Trib Rapture: A Bucket Full of Holes! – Let's Get It Right! Hello everyone! I have now completed my new book on the Pre-trib rapture teaching. It is a comprehensive examination of the many facets of the Pre-trib error which will leave no doubt in your mind as to the incorrectness of that doctrine! In this book I will help you recognize the deceptive practices used to promote the pre-trib theory. I will show you how it has been fabricated using snippets of verse pulled out of context, deceiving distractions, totally unfounded claims, and even outright lies. You will even see that most of the ‘catch phrases’ of the pre-trib story are actually snippets stolen away from passages clearly speaking of the Second Coming of Christ! The myth of a pre-tribulation departure of the Church is a provable falsehood that directly contradicts the plainly stated truths of God’s Word concerning the Coming of our Lord and our gathering together unto him! The Bible is NOT speaking different things to different people about the end-time scenario! We are given a very clear pattern the events of the final years will follow. Why then all the confusion? 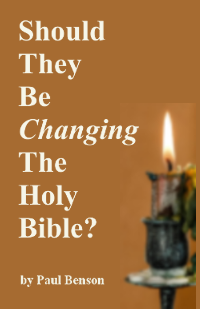 Because some are choosing to believe what is plainly and clearly taught in the Scriptures; and others are being seduced by cunningly devised fables into believing things that have no foundation in the truth of God’s Word. One will bring you truth; one will bring you lies. Which have you been listening to? I will show you a tried and trustworthy method to discern the difference between the two, and weed out the falsehood. It’s no big mystery; nor an expensive date! It is called critical examination. It’s as simple as studying the relevant Scriptures in their rightful context, and demanding a foundation in the Word for each aspect of doctrine claimed to be Bible truth. If a concept has no validation in the Word it is NOT Bible truth, and needs to be shunned! We will put the pre-trib theory up against this standard, and watch it fall apart piece by piece! Right before your eyes! I also discuss the danger and damage associated with embracing and promoting the pre-trib doctrine. It is not a benign teaching; nor is it a non-issue. There is much damage being done by that doctrine which will endanger the very souls of countless people in the days ahead; bringing them into the final conflict with Satan out of sync with God, and greatly lacking of oil for their lamps. And there will be great accountability for those who have so damaged the Body of Christ with their ear-tickling fables of escapism. Please join me as we take a good look a the pre-trib teaching, and prove conclusively that it is nothing more than A Bucket Full of Holes! The book is available in PDF, E-Pub, and Kindle /Azw3 formats. For your free copy just click THIS LINK and you will be taken to the download page. If for some reason that link does not work you can use THIS ONE. (PDF only) Do you know someone who you think might benefit from this book? Why not e-mail them a copy of the book, or maybe a link to this page? May the Lord deliver his people from all falsehood; and guide us into his perfect Truth. P.S. If you like you can leave comment or criticism on the book in the section below. I would love to hear your opinion. But be forewarned. I will not post overly long comments, or ones full of false teachings. Why not just spit out the truth for the world to hear, instead of pushing your book? All the truths expounded upon in the book are also discussed in the articles available on my blog. They are just grouped together for a consideration that would take a lot less time than searching out and reading all the articles. As far as ‘pushing the book’ goes… I offer all my work at no charge; so what’s the beef? 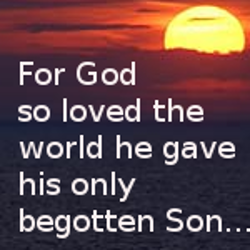 Freely I have received so freely I give. Though your critique of the book was negative, I do appreciate the advertisement! I think that most with much discernment would recognize the ‘if you can’t refute the message then attack the messenger’ style to your critique; and see that attack as a positive light upon the true content of the book. For example: in referring to my exhortation in my introduction to the book that people should prayerfully read my book and ask God to speak to them about what they are reading because “Words of truth only truly become words of life when the wind of the Spirit blows upon them.” you twisted that exhortation into an accusation that I was declaring my book to be inspired of God. I neither stated, nor do I believe, any such thing! I was merely following suit with the words of the Apostle Paul when he said ‘prove all things and hold fast to that which is good’; which I consider to be excellent advice. I hope that all (including yourself) would actually ASK GOD for the truth on the issues I raise; instead of just looking for excuse to discount the evidence I give that the pre-trib theory is unworkable. SO… go ahead and attack if you must; but I think most will see that attacking as you sidestepping the firm points made in the book that so many others have thanked me for pointing out. Like the fact that so many of the catch-phrases used to promote the pre-trib doctrine (Thief in the night, no man knows the day or hour, left behind etc.) are stolen away from verses that in their true context are referring to the Second Coming. May the Lord open all our eyes, ears, and hearts to get free of the doctrines of man and bask in the true teachings of our God! Fantastic site! Readers are invited to check out “Ready for Rapture Astrology?” which is currently featured on the “Wolves in Sheep’s Clothing” blog hosted by prophecy expert Treena Gisborn. Checked out the site. Looks very interesting! Thanks for the link. Found out about your ‘Bucket of Holes’ ebook from John Little’s Omega Shock blog post (February 17, 2017). It is one of the best works I have read in a long time. I will enjoy checking out the other articles on your site! From an early age (probably 9 yrs old) I read the Bible for myself and observed many things that were said and done in ‘church’ were not in there! A plain reading of the text is what is needed for those who believe in Tall Tales. Oh well, if we can’t convince them now, events in real life will play out and they will be shocked to their bones. That may be one of the causes of the Great Falling Away. The disappointment too hard to bear. I also believe the confusion and disillusionment many will face in the days (or more likely daze) ahead will play a big role in the falling away. The antidote to the poison of error is always the truth. My calling is to make that truth available to those who will accept it. Thank you, Paul. I enjoy your blog and am looking forward to reading your book! Previous Previous post: A Deceiving Distraction: Who Is The Restrainer Of 2Thessalonians 2:7?